There are several studies coming out these days about the power of trees to help humans reduce stress, but perhaps the most impressive are a handful that show how they can even reduce our rate of car accidents. 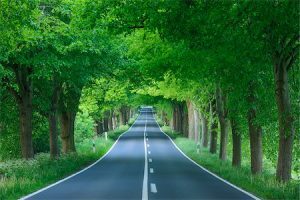 Three studies in the last few decades have demonstrated how planting trees along urban streets and highways reduces the rate of car crashes. A 2006 study found that “greening” the highways at 10 sites across Texas reduced car crashes at those sites by an average of 46%. An earlier German study, in 1990, found lining urban streets with trees and other greenery cut the overall crash rate by 30%, the number of accidents with injuries by 60%, and the number of accidents involving street-crossing pedestrians by 80%. A 2003 study in Toronto, Canada found adding trees and planters to urban streets reduced crashes up to 20% over a 3-year period, even while crashes in general were on the rise in the city. “Commuting can be one of the most stressful experiences of urban life,” write researchers from the University of Wahsington, who analyzed the studies in a paper called Safe Streets. The researchers recommend incorporating more vegetation into roadside landscaping to ease driving stress, pointing out that multiple studies confirm the restorative effects of simply viewing nature in urban settings. In simulated driving study, researchers presented drivers with a stress-causing stimulus and measured their recovery. Those viewing built-up, strip-mall-style roadside environments showed a slower and physiologically incomplete recovery. Participants viewing more natural roadside scenes (forests or golf courses) returned to baseline faster. The anger and frustration often associated with stressful experiences may trigger unsafe or aggressive driving, the Washington University researchers add, pointing to another study that measured college-age drivers’ emotional responses to stressful driving scenarios on videos of both natural and urban streetscapes. The results indicated green roadsides may be a preventive factor in road rage behaviors.